Already a four-time winner at the Cheltenham Festival, as well as a Grand National winner, Tiger Roll has carved his name, indelibly, into the annals of history. However, still only a nine-year-old, and officially 8lb ‘well in’ for his attempt to become the first back-to-back winner of the Grand National since Red Rum in 1974, Tiger Roll is a top-priced 9/2 to defend his crown. 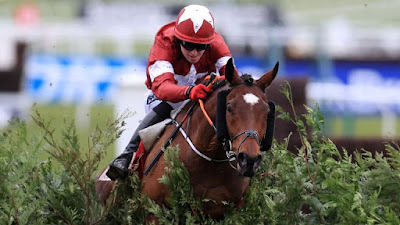 When the Grand National weights were revealed on February 12, Tiger Roll was allotted 11st 1lb, commensurate with an official handicap rating of 159 but, following an effortless, 22-length victory in the Glenfarclas Cross Country Chase at Cheltenham on March 13, his rating was raised to 167. However, no penalties are applied to horses who have won since the publication of the Grand National weights so, with British Horseracing Authority (BHA) handicapper Martin Greenwood freely admitting that he has ‘possibly underestimated’ the level of the Cheltenham form, the continued support for Tiger Roll is, perhaps, understandable. Indeed, Tiger Roll has the potential to become the shortest-priced favourite for the Grand National for a good many years. That said, the shortest-priced favourite in the history of the Grand National was Golden Miller who, in 1935, was sent off at 2/1 after breaking the Aintree course record the previous year; he unseated jockey Gerry Wilson at the open ditch known as ‘Booth’ on the first circuit. The shortest-priced winner of the Grand National, though, was Poethlyn, who was sent off at 11/4 favourite in 1919; he had also won the previous renewal, known as the ‘War National’, staged at Gatwick Racecourse in 1918. Before you steam into Tiger Roll, it is worth remembering that several horses have threatened to start the Grand National at, frankly, ridiculously short prices, only for punters to come to their senses on the day of the race. In 2008, Cloudy Lane, trained by Donald McCain, went into the National chasing a four-timer and seemed likely to be sent off at around 7/2, before drifting to 7/1. In 2015, it was a similar story with Shutthefrontdoor, trained by Jonjo O’Neill; seeking to give Sir Anthony McCoy his second National winner on his final ride in the race, Shutthefrontdoor came in for sustained public support before drifting to a more realistic 6/1 at the ‘off’. It is also worth remembering that plenty of recent Grand National winners, including Bindaree, Hedgehunter, Comply Or Die, Ballabriggs and Many Clouds, have tried and failed, to emulate Red Rum. Hedgehunter and Comply Or Die did, of course, finish second on their second attempts, in 2006 and 2009, respectively. Both horses were 10-year-olds by that stage, with Hedgehunter carrying 12lb, and Comply Or Die 15lb, more than they did the previous year so, having already won off his revised mark, which is 9lb higher than last year – and being only a 9-year-old to boot – Tiger Roll may yet be making headlines, once again, on April 6.